Every jewellery box needs a statement necklace – and this oval-shaped design is a standout choice. Bold, chunky and gloriously shiny, it'll add last-minute glamour to a T-shirt and jeans. 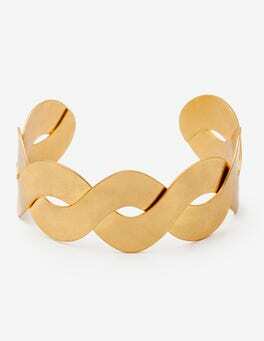 Easy to weave into any outfit, this cuff might just be your latest jewellery-box hero. It's supremely versatile: layer with bracelets in contrasting shapes and textures on your wrist, or embrace simplicity by wearing alone on your upper arm.